Steampunk… just the word brings to mind an image of rich leather, gleaming brass, strange maps and turning gears. A time that never was, in a world that’s only partly recognisable as our own. I love the steampunk ethos of creativity, of living in a world where people still spend time making things, and making them beautiful (and I think beam engines are beautiful, so that’s where my aesthetic sensibilities sit on that). 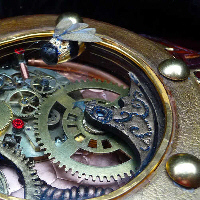 I also love the variety – everyone’s own personal idea of what makes something steampunk seems to be slightly different. You’ve got everything from re-enactment quality metal and leatherwork to pick-a-thing-and-stick-a-cog-on-it (yes, I’ve fallen into that trap and what of it). Although I’m a relative newcomer to the growing genre that is steampunk, I’m happily casting aside the ‘dip my toe in the water’ approach and am launching myself bodily into the upcoming Steampunk Solstice event in June. I’m also working with the fabulous Helen Rich of Xothique Designs to develop a new brand specifically for our steam-related creations, so watch this space for more about that. This entry was posted in Events and tagged events, News, Steampunk. Bookmark the permalink. Both comments and trackbacks are currently closed. Yotsuba&! by Kiyohiko Azuma (Yen Press) Rated: ALL AGES If you like: Smile, Ramona Quimby, realistic kid stories, the silly optimism of SpongeBob SquarePants Yotsuba&! depicts the everyday adventures of a quirky, energetic young girl named Yotsuba as she learns about the world around her, guided by her father, neighbors, and friends. The series has no continuing plot—the focus of the stories is Yotsuba’s daily voyage of discovery. She is shown finding enjoyment in nearly everything, and her constant enthusiasm is infectious. Azuma is a master of crazy expressive faces and humorous body language. The series is really all about appreciating the small moments of life and Azuma really captures this in ways that are times sweet and other times jaw-dropping hilarious. A scene where the young Yotsuba goes to a petting zoo and accidentally punches a goat has to be seen to be believed. The art has a nice contrast between the cartooniness of the main character and the traced photographic realism of the backgrounds.